I like cooking and I’ve been known to bake a cake or two in my time, but I’ve never really got my head around decorating cakes. It’s partly because I’m very clumsy. 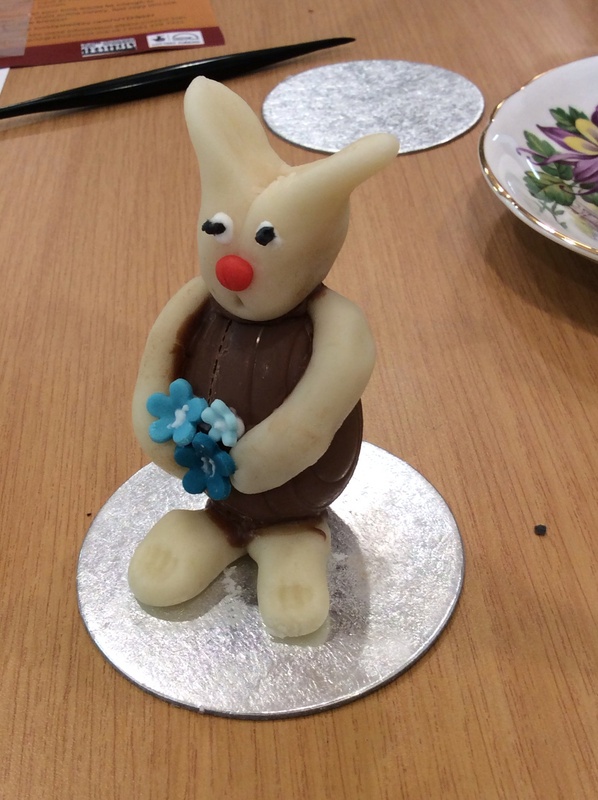 On Wednesday night, I joined a lovely bunch of ladies at Cottonpollis WI (www.cottonopoliswi.com) decorating chocolate eggs as rabbits, chicks, swans and all sorts – it was so easy to do so I thought I’d share with you what we did. I’ve been an member of Cottonopolis WI since it started in January 2015. It’s wet here today so no gardening today. This was the first time I’d done any piping ever. He looks a bit ‘max wall’ – my chap was very impressed though and I’m not sure he’ll last to Easter Sunday. This entry was posted in Food and Drink, Women's Institute and tagged cake decorating, chocolate, Duck, eggs, Rabbit, Women's Institute on April 3, 2015 by Bec - views from my garden bench.